Maybelline The Nudes palette-the cheap Naked palette? One of the drugstore purchases I picked up in the US is the Maybelline The Nudes palette which I bought from Walmart for about $10. I know this came out ages ago but in the back of my mind I felt people had been quite complimentary about it. What struck me when I saw it was 'is this a cheap Naked palette'? Now I have had time to test it out I will tell you what I think. I loved both Naked 1 and 2 and they're my most used and abused eyeshadow palettes (evidenced above!). What I think the Maybelline The Nudes palette does is encapsulate some of the best of the Naked 1 and 2 shades in one user friendly and cost friendly palette. The shades aren't quite as buttery as the Urban Decay ones, but I think Urban Decay make some of the best eyeshadows available so the competition is stiff. The Urban Decay Naked palettes are packed with pigment and blend seamlessly-but I genuinely think The Nudes is not a bad effort at all for the price point. 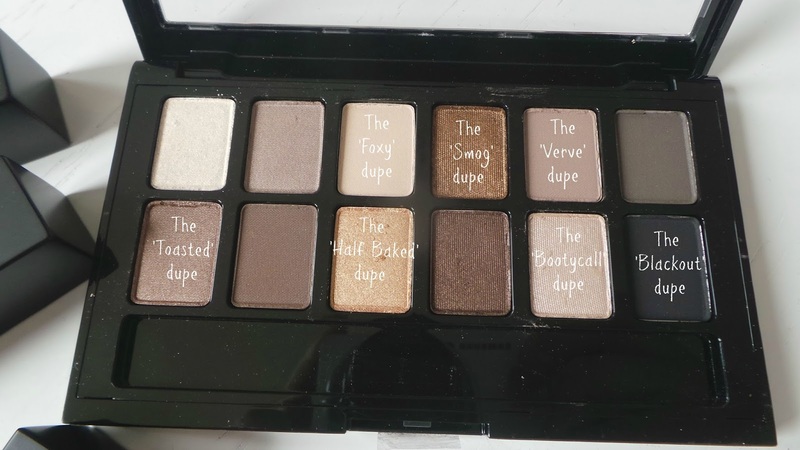 I've picked out below some of the most obvious dupes across the two palettes. I've had no problems with blending and the pigmentation, especially in the shimmery shades is good. There's no really disappointing shades and there is a good mixture of matte and shimmer shades across the palette. Admittedly I would still plump for the Naked palettes over this one because the texture is phenomenal but this palette definitely gives some of my higher end eyeshadow palettes a good run for their money.